I absolutely love sweet potatoes. I love potatoes of any kind, really, but sweet potatoes definitely hold the top spot on my list. 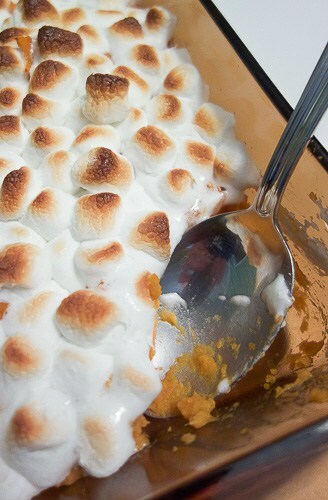 One of my favorite side dishes growing up was sweet potato casserole with marshmallows. 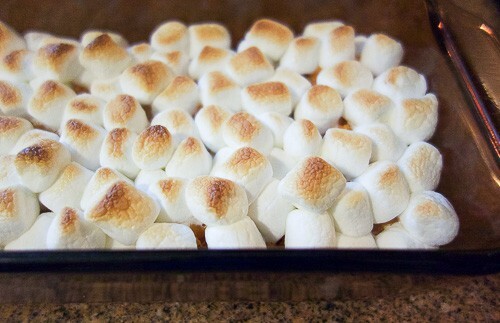 How could you not love mashed sweet potatoes sweetened with brown sugar and cinnamon, and then topped with toasted marshmallows?! It’s heaven in a casserole dish. I realize that many of you may associate sweet potato casserole with Thanksgiving. At my house though, as well as when I was kid growing up, it was not just relegated to Thanksgiving dinner. We had (and now have) it year round. Quite frankly, I can’t imagine why you would limit this dish to special occasions when it is so easy and so delicious. I mean, toasted marshmallows…. ‘Nuff said. I believe the recipe that my mom gave me years ago came from my grandmother. The original recipe is much more along the lines of what you may envision a “casserole” to be, than what I make. I have simplified the recipe down to the bare minimum of ingredients. I like my food to be as simple and easy as possible. Have no fear though! It is still every bit as delicious. Unfortunately, this is one of those dishes that I usually throw together without measuring. I just “eyeball” it and taste test until it is to my liking. So, the recipe includes my best guesstimate for ingredients. This is a super flexible dish, though. So, I encourage you to taste test as you go, to make sure it is just how you like it. This simple sweet potato casserole is easy to make and absolutely delicious. Peel sweet potato and dice into 1/2 inch pieces. Dump diced potato into boiling water. Boil until very soft (approximately 10-15 minutes). Drain. Transfer potato mixture to small baking dish. I use a 5 x 9 in. dish. 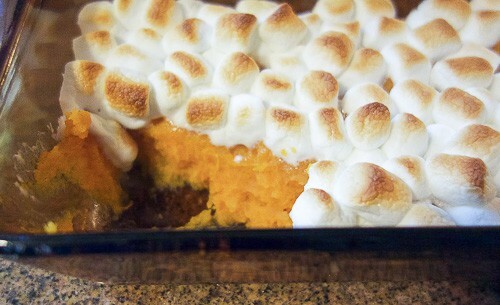 Top the sweet potato mixture with an even layer of mini-marshmallows. Put it back in the oven in order to toast the marshmallows. Do NOT walk away from the oven during this step. The marshmallows only take 1-2 minutes to toast, and they will burn VERY quickly if you are not watching them. I literally stand by the oven with the oven light on and watch them until they are lightly browned. When they are nice and golden brown, pull it out and let cool slightly. Makes me think of Thanksgiving! Thanks for sharing on the What’s for Dinner link up! I think that’s what most people think. We enjoy it year round, though! Thanks for hosting! Thanks so much, Sadhna! I love sweet potatoes, and this is one of my favorites! Hopefully, you will enjoy it as well. Oh, I hope you all love it! I love the simplicity of it. And yes, it’s a great way to get the kids to eat their veggies. I wonder if my daughter would go for broccoli if I topped it with marshmallows… Thanks so much! I love sweet potatoes, any way you cook them up! But sadly my family doesn’t eat them. Who doesn’t like sweet potatoes? I’m going to whip this up and save it all for me, it looks way to delicious not to have! I’ve never made one like this, it’ll be a first. Excited! What?! How is it even possible to not like sweet potatoes? I love them. We are not big on leftovers at my house. I usually try to cook so that there is just enough for dinner, and maybe some left for my husband’s lunch the next day. I ALWAYS make extra of this though, so that I can eat on it for a couple of days. 🙂 I hope you like it! I would never have thought to top with marshmallows! Thanks for sharing with us at #overthemoon linkup. I’ve pinned and shared. Thanks for the share! The marshmallows really make the dish. Who doesn’t love toasted marshmallows?! That picture caught my attention right away. My mom used to make this recipe for Thanksgiving. Sadly I lost her this past December, but I have wonderful memories to sustain me! Thanks for sharing on the blog party. So sorry to hear about your mom. Recipes and dishes are always great reminders of those we love. We love this dish at my house, and it has been in my family for quite awhile as well. 🙂 Thanks for sharing your story with me! This is like Thanksgiving and the Fourth of July all rolled up into one. I love sweet potatoes but they are so expensive here that I only eat them when I am visiting the States. I’ll have to try this recipe when I go back!